November 2013 update. 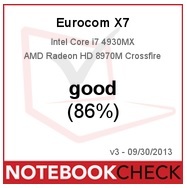 Here you will find the current best gaming notebooks reviewed by Notebookcheck in the last few months. 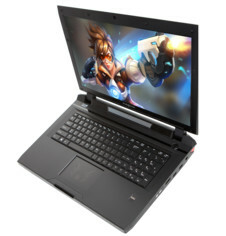 The 17.3-inch Eurocom X7 is the reseller's top-of-the-line offering catered for gamers...Since this is Eurocom we’re talking about here, expect almost all the features and configurable powerful hardware options you can imagine included with the X7. Our last review on a Eurocom left us great impressions because of its extreme system performance, abundant storage options and high quality display. 3DMark scores are nearly unmatched. the notebook’s 3DMark 2013 scores are again one of the highest in our database. With a 3DMark Fire Strike Extreme score of 4212 points, it is second to none – even the desktop GTX 680 and Core i7-2600K score “only” 3049 points in the same benchmark. The main maintenance hatch on the belly of the unit provides direct access to nearly all components including both MXM 3.0b GPU slots, all three system fans, CPU, one of the mSATA slots, 2x SODIMM RAM slots and the half-mini PCIe WLAN card. Popping off the cover only involves loosening four Philips screws for quick end-user changes as needed.